The Hoover Institution – Washington, D.C.
We cordially invite you to a commemorative forum. Following a short film of Buckley’s most memorable exchanges on Firing Line, L. Brent Bozell III, Lee Edwards, and NR‘s Ramesh Ponnuru will discuss the historical significance of Buckley’s legendary television program and his tremendous legacy. Next there will be a discussion between Margaret Hoover,Senator James Talent, and Michael Franc on American political discourse and Buckley’s legacy. We hope you will be able to join us for this special event. 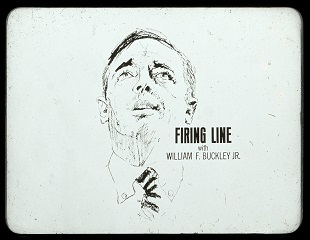 In addition to articulating conservatism through the pages of National Review, a half century ago William F. Buckley Jr. took his mission of advocacy and engagement to America’s airwaves, providing the movement a truly national reach and appeal through his inspired program, Firing Line. In this powerful, weekly television force, which resonated with countless Americans who found in it a spark that ignited their own conservative fervor, Buckley fostered intelligent discussion – of key events, of core principles, of leading policy-makers – with figures Left and Right, and helped turn the fledgling conservative movement into a consequential cause that achieved success for the ideas of free peoples and free markets, and that exposed the maladies of the aggrandized state. Five decades later, Buckley’s Emmy Award-winning program – the longest-running public-affairs show in television history with a single host – and his own timeless conservative legacy, remain as important as ever. The Hoover Institution Library & Archives, which houses an extensive array of documents, transcripts, photographs, and film footage in its Firing Line collection, works to make Buckley’s episodes broadly accessible, digitally and in public settings. As part of NRI’s mission to preserve and promote the legacy of William F. Buckley Jr., in 2015 it launched The Buckley Legacy Project, designed to make Buckley’s work on crucial, relevant topics accessible to our supporters, friends, and allies within the conservative movement, and, importantly, a new generation of citizens and intellectual leaders. As such, this spring, NRI and Hoover are pleased to partner in celebrating the 50th anniversary of Buckley’s iconic program, Firing Line in three cities: Dallas, New York, and Washington, D.C.
We hope you will join us in Dallas in our effort to spread Buckley’s message and continue his invaluable work to better our country and educate our citizenry by celebrating Firing Line’s Golden Anniversary. Please note that seating is limited. For more information, or to RSVP, please click here or call Alexandra Zimmern, NRI Events Officer, at 212-849-2858. If you are already registered, we look forward to hosting you soon!